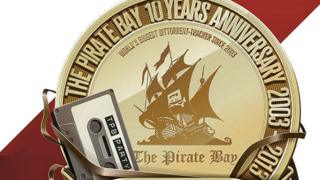 A Dutch court has told local internet service providers they can restore access to The Pirate Bay. The ISPs had been ordered in 2011 to stop internet addresses linked to the file-sharing site working. But the Hague Appeals Court has reversed the decision on the basis it had proved "ineffective" at reducing copyright infringement. Anti-piracy group Brein now faces having to pay 400,000 euros ($547,000; £330,000) of the ISPs' legal costs. It has said it may lodge a further appeal with the country's Supreme Court. One UK-based ISP said it was studying the ruling to see if there were any implications for a similar block imposed by the High Court. "We will look carefully at what this means for the UK, but we do remain beholden to the UK courts," said Gareth Mead, head of media relations at Virgin Media. The Dutch ruling marks a victory for Ziggo and XS4All - two local ISPs who had argued that the measure denied their subscribers free access to information. The Pirate Bay does not host copyright-infringing content itself, but rather provides lists of links - many of which do lead to pirated films, TV shows, music and books. Brein had initially tried to make The Pirate Bay itself remove such links. After failing to do so, it had convinced the Dutch courts to block users' access instead. But the appeals court heard that web users were circumventing the ban by either finding alternative ways to access the site - such as using a VPN (virtual private network) to mask their location - or by using other file-sharing services. Although there was evidence that Dutch traffic to The Pirate Bay had declined, the amount of torrenting - the way in which computer users share resources to speed up downloads - had not. "This blockade imposed a violation of the basic freedom of commercial activity of the providers with insufficient justification," the court's ruling said. "It is of great significance that the providers themselves were not violating copyrights." Brein's director said this decision undermined efforts to encourage the public to pay for legal downloads. "The purpose of blocking The Pirate Bay is obviously to reduce copyright infringement via The Pirate Bay," added Tim Kuik. "It is paradoxical that although the court finds that this goal is indeed achieved, it rejects the blockade because users are going to other sites." Nigel Miller, a technology expert at the law firm Fox Williams, said the Dutch ruling was unlikely to affect bans elsewhere. "Recently the EU advocate general decided that under EU law you cannot issue a site-blocking injunction which is expressed in general terms, but you can require ISPs to take specific measures to prevent users accessing a website with illegal content, even if those measures can be circumvented," he said. "Other courts in Europe will certainly have to take into account relevant EU directives, this opinion of the advocate general and decisions of other EU courts such as this one in the Hague Appeals Court, but ultimately each national can make its own decision based on the facts of the individual case and as to the terms of any site-blocking injunction which it issues." The Dutch ruling is not the only defeat suffered by Brein this week. The Torrentfreak news site has reported that a Dutch man who admitted uploading thousands of e-books to The Pirate Bay has had his case dismissed on a technicality. Brein had claimed that Stefan K had caused about 50,000 euros of lost sales even though he had subsequently taken the material offline. However, a judge ruled that the case should not have been brought to a criminal court as such an offence would be a civil matter.